These forms the Troop needs right way and updated regularly are the Scout/Adult information form and a valid BSA Medical Form. 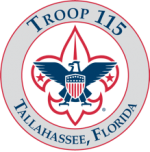 If you intend to volunteer or camp with the Troop you must complete the online training. Once complete, print out the certificate and turn in to the Troop office. Listed here are downloadable links to the numerous forms and handouts used by the Troop for membership, camping, uniform insignia, etc. Files are pdf’s unless otherwise noted. There are several websites listed here. The SRAC website has information on Summer Camp and High Adventure opportunities. The BSA websites have more general information that may be helpful in learning about Boy Scouts.